Situational awareness: "Amazon is starting to sell software to mine patient medical records for information that doctors and hospitals could use to improve treatment and cut costs," the WSJ reports. 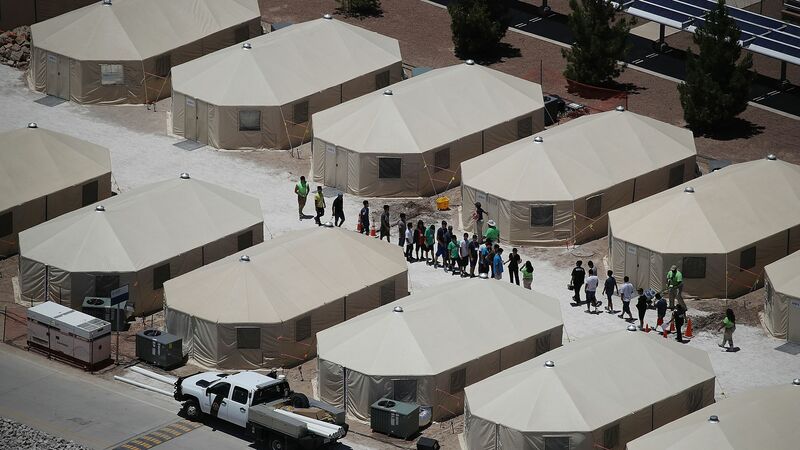 In just six months, the Trump administration has built a detention camp for migrant kids in the Texas desert that is larger than 203 of the 204 U.S. federal prisons. Driving the news: The Tornillo camp now holds 2,324 boys and girls, most from Central America, between the ages of 13-17, the AP reports. Why it matters: "Confining and caring for so many children is a challenge. By day, minders walk the teen detainees to their meals, showers and recreation on the arid plot of land guarded by multiple levels of security. At night the area around the camp, that’s grown from a few dozen to more than 150 tents, is secured and lit up by flood lights." Security: The 2,100 staffers haven't done FBI fingerprint background checks. Costs: "What began as an emergency, 30-day shelter has transformed into a vast tent city that could cost taxpayers more than $430 million." Rules: "Under federal policy, migrant youth shelters generally must have one mental health clinician for every 12 kids, but shelter officials have indicated that Tornillo can staff just one clinician for every 100 children..."
Timeline: "Federal plans to close Tornillo by New Years’ Eve will be nearly impossible to meet... Planned closures have already been extended three times since this summer." The big picture: The Trump administration is struggling to care for a record number of migrant minors in its custody, it has sent troops to the border and launched tear gas at migrants seeking to illegally cross the border, it's working deals with Mexico and continues to battle the courts over executive actions to curb immigration, Axios' Stef Kight reports. The bottom line: There are more than 14,000 migrant children in U.S. detention, most from central America. Figuring out what to do with these kids is a challenge that doesn't seem to be going away. A seat left open for Mark Zuckerberg at the U.K. Parliament (he didn't show.) Lawmakers from nine countries grilled Facebook executive Richard Allan today as part of an international hearing at Britain's parliament on disinformation and "fake news." Trump is looking at ending electric vehicle subsidies for General Motors over its decision to idle four plants in the U.S. and cut 15% of its salaried workforce, he tweeted today. Go deeper. 52% of Americans would feel "very comfortable" with a female president, according to a new study by Kantar Public. By the numbers. The NRA's total income in 2017 dropped by nearly $55 million, with a sharp decline in membership dues and contributions largely responsible for the dip. Go deeper. The latest in a string of media company executives stepping down from their positions this year: Condé Nast's CEO Bob Sauerberg and The Economist's CEO Chris Stibbs. Fuller list. A new generic EpiPen carries the same $300 list price as the generic EpiPen that Mylan rolled out in 2016. P.S. Christopher Ailman, who manages $220 billion and helped put together a large investor coalition that is asking gun makers, distributors and retailers to act more responsibly, was on today's Axios Pro Rata podcast. Go deeper. "The Best Spot in the Office Is a Phone Booth—If You Can Get Into One" — The WSJ's Sarah Needleman dives into the travails today's open office workers face securing enough privacy for a phone call — or even to just concentrate on their work. "In the scramble to find a soundproof sanctuary, some employees have resorted to bribery. Others have found unwelcome surprises inside the booths, or discovered that the privacy pods aren’t actually so private." "Even on trade-show floors, they’re in demand. SnapCab Inc. often finds attendees squatting in its display units. 'We’re trying to sell the booths, but they don’t care,' said Glenn Bostock, CEO of the Warrington, Pa., company."